In my mom’s purge of her house, she bequeathed me two 11 x 14 Olan Mills studio portraits of (you guessed it) my younger self. One of the portraits was of me as a baby; the other was of eighth grade cheerleader me. Obviously, I was NOT about to hang those anywhere in my house (nor post them here! ), but I thought the frames and canvases might be useful separately rather than together. 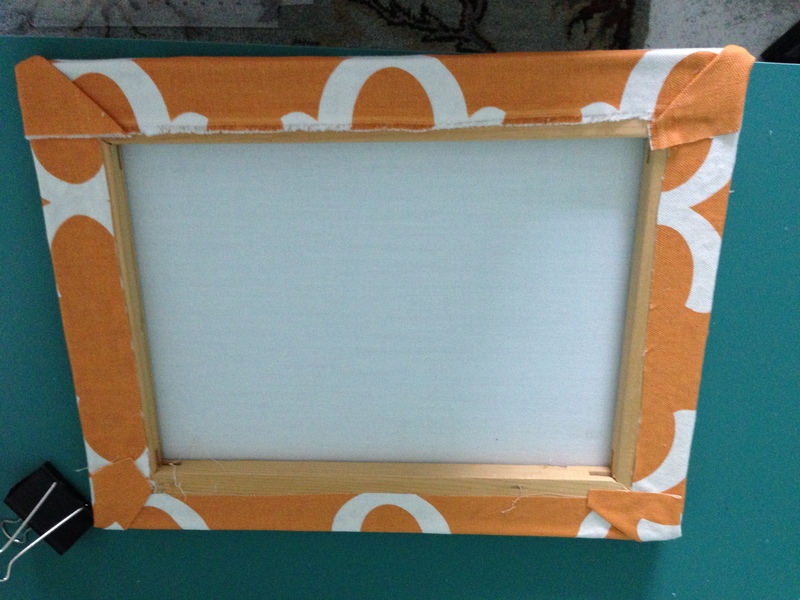 I removed the backing paper and then pried the canvases from the frames with my bare hands (not kidding), which left me with one potentially interesting brassy frame and one other frame that I decided to send to Goodwill. I used a pair of pliers to remove the lingering staples. The brassy frame had two picture hangers in the back, to which I tied a ribbon in order to make a more interesting wall hanging. The brassy frame was just the piece I needed to help an odd assortment of art and picture frames from Chris’ family come together in the form of a gallery wall.You can’t really get a good angle for a quality picture, so I’ll provide a description. It looks better in real life, trust me. Chris’s mom did the cross-stitching matted in green, and the narrow photo is of the yard from his childhood home. The two pressed flower pieces were gifts from his paternal grandmother; a friend of hers made them. The plaque (I think it came from Target) says “All because two people fell in love” and was a gift from his youngest brother/mother for our first Christmas as a married couple. The three mahogany frames were also from his grandmother. Previously, these pieces seemed out of place in our new beach home, but these aren’t exactly pieces we could part with. Now, they live happily together in our guest hallway–an empty pass-through space that was begging for some visual interest to make people linger a bit longer. 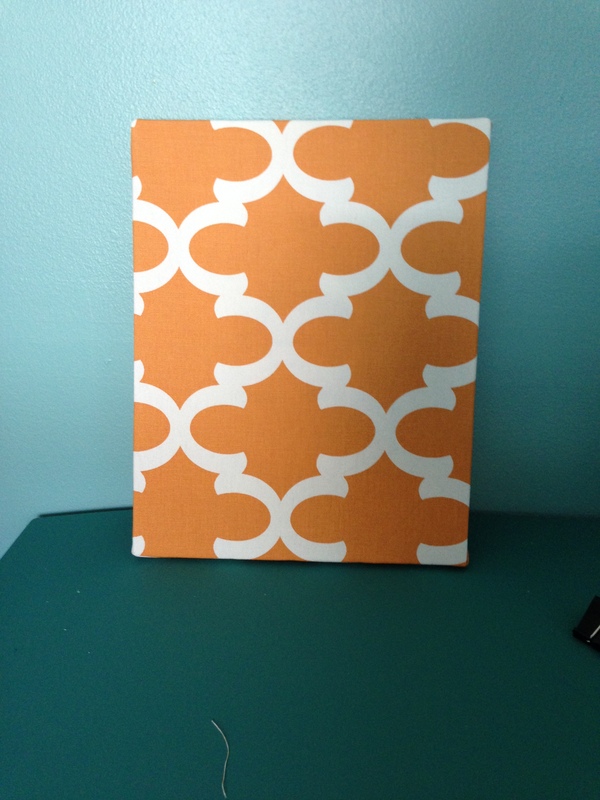 As for the baby portrait canvases, I decided to make pin boards from them. 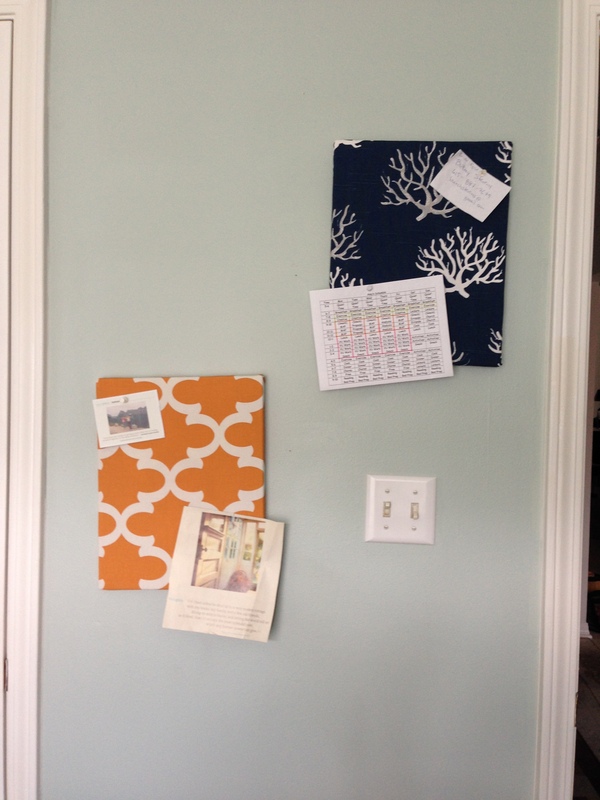 Yes, how old-fashioned of me to like a real pin board, right? I love Pinterest, but when it comes to work productivity, I am one of those people who need to see and touch things in order to remember them. Electronic reminders just don’t do it for me, much as I love Evernote and other apps. I planned to remove the scary former-self pics, but that wasn’t happening. I used some home decor fabric remnants I had leftover from other projects to cover the canvases (Tip: Use home decor fabric, preferably in darker colors, to prevent your former self from staring at you being visible through the fabric. The orange fabric you see below was sufficient for hiding the soft pastel colors of the baby portrait, but I used a darker blue to hide the cheerleading uniformed me.) 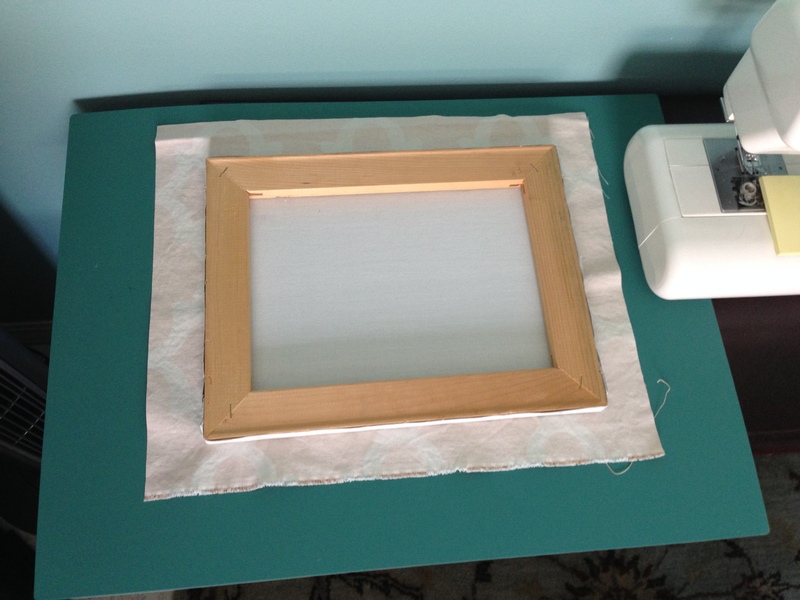 I measured my canvases and then cut the fabric, allowing enough extra material to wrap around the canvas and secure at the back (I added roughly 4 inches to the dimensions, making my fabric pieces about 15 x 18, to allow for about two inches extra on each side of the canvas). I positioned the canvas on the fabric where I wanted it, making sure the pattern was in the desired location, and laid it facedown on the fabric on a flat surface. You may want to do the positioning before cutting if you have a super large scale print to ensure that what you want to see is what you actually get. 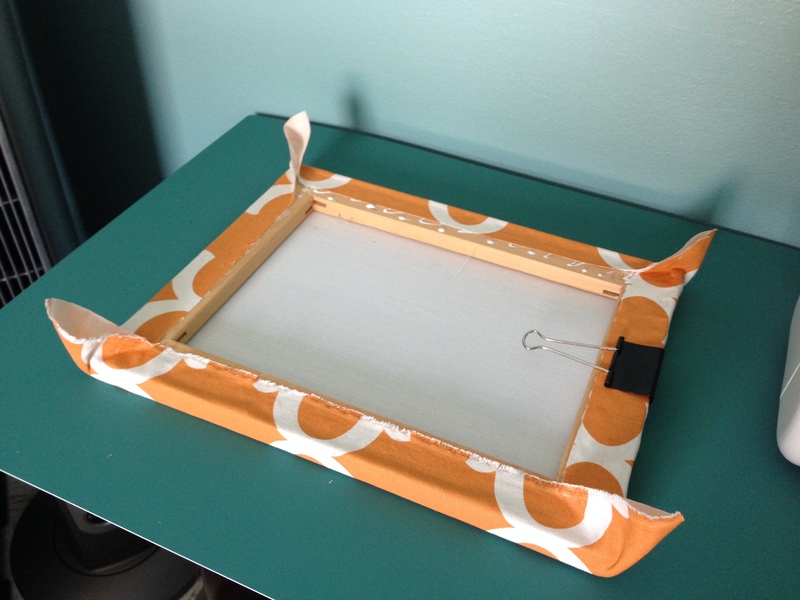 I put too much Tacky Glue on the frame and folded the first side of fabric over the edge of the frame, smoothing it and securing with a big binder clip. I wiped off excess glue along the way. I repeated this step three additional times for the other sides, leaving the corners for last. For the corners, I treated them like upholstering the seats of dining chairs, drawing the fabric taut and securing with glue. 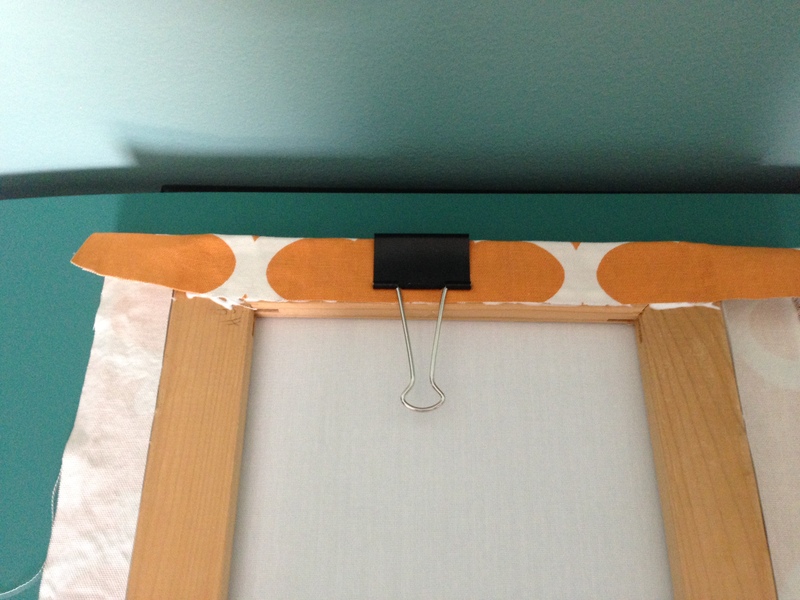 I also used the binder clip to help hold the corners in place while the glue dried to ensure the material stayed taut. Now I have two pin boards that hold inspiration quotes, contact info, my schedule, etc. You can imagine my mother’s shock when she found out what I did with these old portraits–pleasure at my creative and inexpensive (free) repurposing of useless things and horror at the thought that I am stabbing myself as a wee child. I suppose it’s a bit creepy, but I do sort of chuckle to myself every time I think “pin the nose on the baby” when I add something to my boards. So if you find some of those gargantuan portraits of you from your childhood in the attic/basement, you don’t have to burn them. Your former self can be repurposed to help your current/future self remember things, which is really quite thoughtful of you. them. I mean, erm, I think I’ll end here before this post gets any weirder.